Sensory nerves in the soles of their feet, as well as the joints, tendons and muscles communicate where the ground is, how hard it is, and whether it can support the body. For instance, if the dog is running and places a foot into a hole, the changes in the angle of the leg and pressure on the foot will trigger a fast withdrawal of that leg and shift of the body weight, preventing a potential accident or injury. However, modern environments tend to alter the sensitivity of this feedback mechanism. Dogs spend increasing amounts of time on slippery floors - very different from grass, stones, sand, snow, or dirt! This, combined with limited exercise, can impede the foot-brain connection. Dogs, like many domestic animals, are highly adaptable, and most individuals with a normal nervous system can easily adjust to these environmental changes. But when a dog has neurologic deficits such as those that develop with advanced age, arthritis, or spinal disease, reduced feedback from the feet can hinder locomotion. One of the most common foot issues in domestic dogs is long toenails. Ideally, the nails should not touch the ground when standing on a firm, level surface, but are long enough to provide traction when climbing a hill or digging. 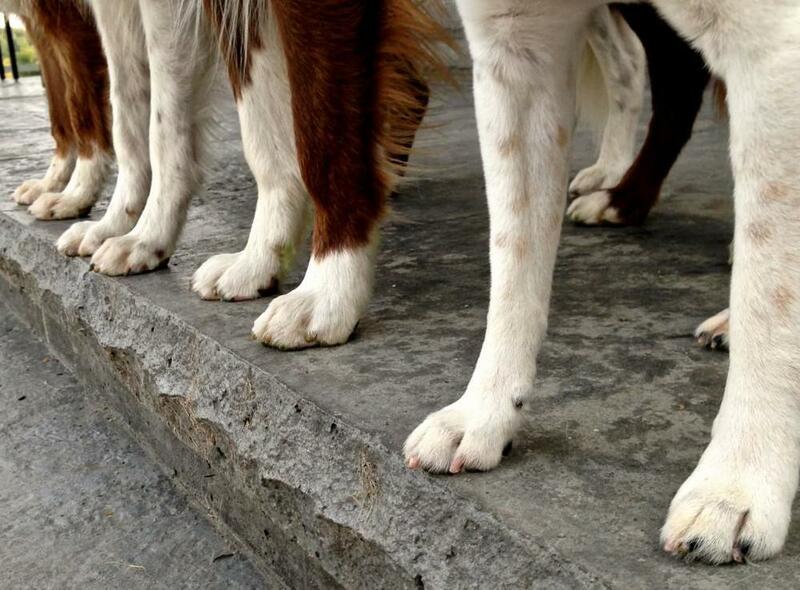 In a dog with long nails, the neurologic signals from the toenail tell the brain they are experiencing an inclined ground surface. The abnormal compensatory posture results in excess weight shifting onto the hind legs, overloading those joints. Despite the health benefits, the average dog might realistically only get a nail trim a few times a year. Many factors contribute to making nail trims a dreaded activity, among which is the fact that constant stimulus from long toenails contacting the ground can sensitize the nail bed, making it very uncomfortable for the feet to be handled and predisposing them to the development of arthritis. If you look at a dogs toenail, you can see the hard, insensitive nail around a core of pink, living tissue or the “quick”. The quick contains sensitive nerves and blood vessels, and when nipped, it bleeds profusely. When the toenails are excessively long, the quick grows longer too. The goal is to remove the protective long nail so that the quick will recede. The easiest way to do this is to use multiple small, shallow cuts focusing on the top of the nail, parallel to the quick, not across it. To shorten the quick, the nails must be trimmed weekly or every other week, and sometimes a Dremel is tolerated better. With this technique, it is possible to significantly shorten the toenails, and get an immediate postural response. The quick is shiny and moist- it’s living tissue, and has a different texture than the nail. Getting into the habit of nail trimming early in life is not only a good habit for any dog owner, but can also prevent arthritis and mobility issues in the long term! So take a look at those feet today and consult your veterinarian or rehabilitation therapist with any questions about your dog’s nails!